I chose to create this image because I enjoy being outdoors, seeing nature and water. 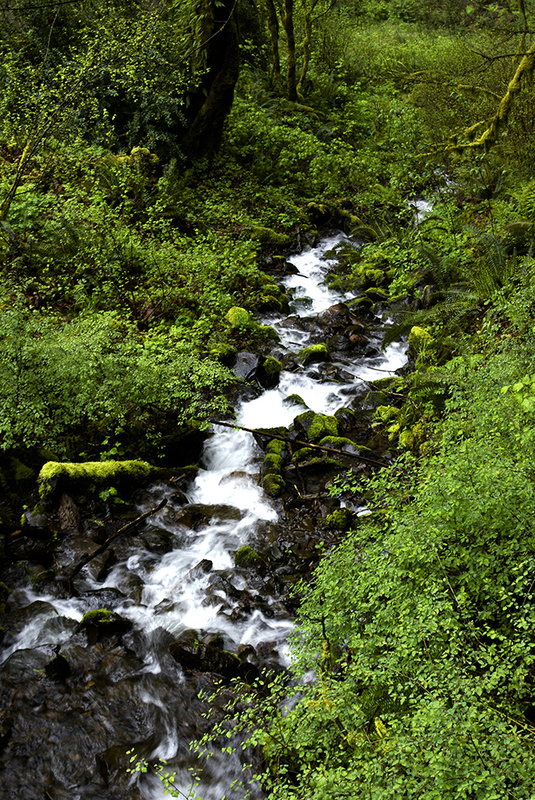 I did not plan to capture this photograph until I came upon it while walking up the trail at one of the waterfalls in Oregon, and happened to look down to see where the water was flowing below the bridge. The main thing I was trying to say with this scene is that we may know where the waterfall starts, but we never truly know where that water ends up even if we follow it all the way down the stream. While taking this picture I was just walking around and taking as many pictures as I could before my parents said they were ready to walk back down toward the truck to leave. I actually took the UV filter off the camera lens to capture a lot of the pictures I took that day because the sun glare streaming from the rain clouds was creating hot spots throughout the first few pictures, and I did not like or want that aspect within my photographs of the falls. This trip to the waterfall in Oregon happened because we made a family trip to Bremerton, Washington, for my cousins wedding in April 2012. After the wedding we were driving back to California which means we have to drive through Oregon. Halfway through Oregon my dad sees a sign that says “waterfall 30 miles.” So he proceeds to ask everyone if they want to go to the waterfall and says that it is only thirty minutes away, therefore everyone says “yeah, sounds like a fun adventure.” About two and a half hours later we finally arrive at the falls and exit the truck to stretch and get prepared to walk up the bridges for the waterfall. I am using my mom’s Sony DSC DSLR-A 100 camera, so I ask her if I can take her camera up the fall with us so I can take pictures and she said I could, as long as I took care of it, although she knew I was going to because I had been using it for classes for three semesters by this point. I promised I would take care of it and then we started toward the fall and I keep stopping at random points trying to get different angles and different viewpoints of this magical place. Then after walking what seemed to be forever, making it halfway, we stop because of it being a long walk in the cold, rain, and wind. I happen to glance down, while I was looking anywhere and everywhere, and I see this small stream on the side of the bridge next to the main waterfall stream because it is in its own area between the trees and foliage. I take some pictures standing up and then kneeling down and at one point I was almost sitting down trying to get a right angle while adjusting the settings on the camera to get different lighting and perspectives. I achieve this shot and quickly put the camera back into my sweater and run to my parents to show them to see what they think and wipe a few water drops off the camera. The final image had the settings of ISO 100 and 1/15th of a second at f/5.6, which caused the water to stay flowing in the picture. The post-production steps that I proceeded to do happened in lightroom and it is simply bringing the saturation back to add more contrasting colors within the greens and the stream with the darker rocks below the water. I’m Jennifer Radke. I started photography classes’ junior year of high school and have been intrigued with taking pictures since and would rather be behind the camera than in front of it. I have worked with my uncle to take pictures of fundraising events they plan. I enjoy being outdoors and capturing photographs within nature, because it is a simple place to relax and inspire me by what is around daily. What inspires me is being able to break my routine and have adventurous walks without knowing where they lead, while enjoying the breeze, clearing my mind, and giving me a new look on life. To read more about the Northern Arizona University “Behind the Image: Guest Blogger” project on our blog, please read the introduction on our April 15 post at youcansleepwhenyouredead.com/wordpress/introducing-the-nau-photography-students-behind-the-image-guest-blogger-project.